I think I know where I'm going to be on Sunday. I'm supposed to hang out with a few folks on Sunday - the plan was just to hit some bars, but this sounds a lot more delicious. 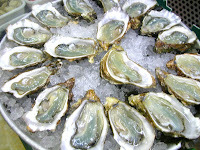 We can hit the bars after the May Oyster Invitational coming up on 5/3 from noon to 8pm. What better way to kick off summer and celebrate the opening of B&G Oyster's 5th patio season than with an oyster extravaganza? Join us on Sunday, May 3rd for a day filled with friendly (and tasty) competitions, signature small plates, unlimited oysters, cold beer and oyster-friendly wines, and even appearances by the WORLD'S fastest oyster shucker! A portion of the proceeds will benefit the Massachusetts Oyster Project, an organization dedicated to the restoration of oysters to marine estuaries in the Boston area. PS. Thanks to Bloggery reader Andrea for the email. 0 Response to "May Oyster Invitational - 5/3"